One commenter on my earlier post on Hayabusa said, "Perhaps I'm just reading it wrong (or missing some vital bit of context), but there doesn't seem to be a TCM after capsule separation. That would indicate that Hayabusa follows the capsule down. What happens to the rest of the spacecraft?" This may be a very frequently used expression, but Hayabusa mission has been a challenge to the unknown. Sample return from an asteroid of 500m length which we saw for the first time in human history and all those difficulties associated with the mission. However, I now wish to touch on another aspect of Hayabusa mission away from its scientific and technological issues. Its key word is "tears". Here, tears is not the usual phrase without which we cannot describe Hayabusa operation. Hayabusa tears are more emotional. Space missions are often supported by visual materials for publicity. For instance "Inori" (earlier posted about) is one of them. It may induce some tears in some places. However, there is another one created by Osaka City Science Museum, "Hayabusa- back to the Earth". This video is shown at planetariums across Japan as part of their 360 degrees viewing (46 minutes) and it has been reported that a lot of viewers are seen making their exits with emotional tears. This makes me think. After all, only a machine appears in these materials and content-wise it is all science and technology and yet these materials seem to bring tears in people. It is important in life to experience emotions and we all know that, but the fact that you can get those from these seems to tell us that science and technology are there for humans. Hayabusa's biggest contribution may be just that. 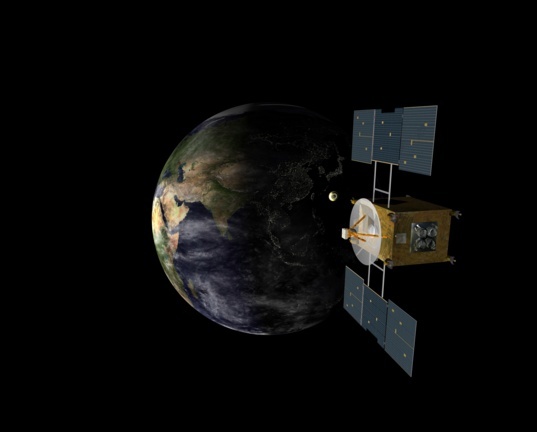 Hayabusa and all the other spacecraft out there aren't just machines. They're humanity's representatives to space. We can't yet send humans where these machines go, but we can still feel an emotional connection to their adventures, both the highs and the lows.